Dear makers of "nose shadow"
You know how you still have that 1 kilo to lose before you get down to your pre-pregnancy weight. Well, here's the thing. That kilo ain't going anywhere unless you stop eating all those office sweets and cakes, and start doing some excercise. It's time I retire you from my car's rear screen window. Firstly, my baby is no longer really a baby, he's now a 1 year old child so you're no longer relevant. But also you seem to bring out the worst in people. Whenever I have you up on my back window I get tailgated, honked at or overtaken even though I drive exactly the same way as when I'm without you. This leads me to think it's not me, it's you. So now it's goodbye. It's just safer that way. All I can think is that Sydney water has been contaminated with the pregnancy virus, because how else do you explain the fact that 7 of my friends and colleagues are pregnant, and all roughly at the same stage. I'd better stay away from this contaminated water because until my baby is sleeping through the night and my life has returned to some kind of normalcy, I ain't interested in catching the pregnancy virus again. I bet you thought I wouldn't write to you again after neglecting you for 4 whole weeks. You'll have to forgive me, I've been busy and besides, nothing exciting had happened to me to write home about. How about we come to the understanding that some Fridays I'll write to you, and some I won't. There's no science to it, just a matter of having spare time and having something to write to you about. Eeep, 3 more weeks and we'll be on our way! We miss you lots and can't wait to see you again. Just a note though, this time around we have our 1 year old little dragon with us so please be kind - I would like to place an order for warm weather, no rain, and lots and lots of potato chippies for Luca to munch on... because as long as there are chippies, there's a happy little dragon. Lol @ Dear pregnancy epidemic! I love it! And I hear you on kids loving chippies, it doesn't stop; even Miss M at four years old counts them as her favourite food. I love reading this segment on ur page.... and want to give u a big hug!!! Hehe where else but Daiso! Great entertaining post! 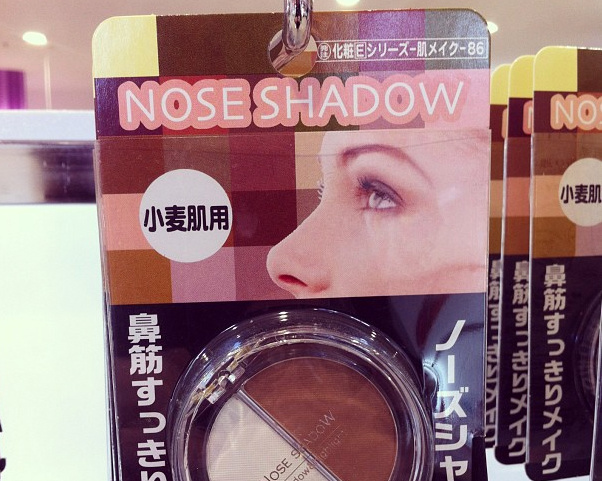 Haha the Nose Shadow,who comes up with these things! ?